Even though the champagne has only just been sprayed at Macau, signifying the close of the 2015 road-racing season, thoughts are already turning to next year’s Isle of Man TT Races fuelled by Monster Energy and Classic TT Races presented by Bennetts with a broad choice of tickets for both events going on sale from Saturday 28th November. The first day of Motorcycle Live at the NEC in Birmingham marks the official launch of the Isle of Man’s road racing season, with tickets for next year’s races available to buy online at http://www.iomtt.com from 09.00 (BST) on Saturday 28th November and from the TT Races stand at the show. You can be right at the heart of the action with a range of tickets including the ultimate race day Platinum VIP hospitality ticket which offers unrivalled access as the racing unfolds, witnessing drama and history through to the famous grandstand on Glencrutchery road and the Fanzone grandstands, positioned around the course at its most spectacular points. You can also buy tickets to the special events including the ‘TT Preview Night’ and ‘MotoGP’ Mad Sunday lunch. This year’s TT meeting features a revised schedule, culminating with the new ‘Championship Day’ with the solo and sidecar overall titles decided on the last race day, Friday 10th June. After a week of qualifying, the race schedule kicks off with the RST Superbike Race and the first Sure Sidecar Race on Saturday 31st May and is followed by Monday's Monster Energy Supersport Race 1 and the RL360 Superstock Race. Wednesday's packed programme gets underway with the SES TT Zero, followed by the Monster Energy Supersport Race 2 and concluding with the Bennetts Lightweight TT, which moves to its new slot, swapping with the Sure Sidecar Race 2, which will open Friday’s race programme ahead of the PokerStars Senior TT. While some of the riders have already confirmed whether they are staying with their teams, hot footing it to pastures new or switching manufacturers in a bid to glean those extra few vital seconds, there is huge interest building ahead of Motorcycle Live at the NEC in Birmingham when some of the leading teams and riders will reveal their plans for next year. Can John McGuinness close on Joey Dunlop’s outright 26 TT race wins or will Michael Dunlop return to his 2014 form and deny the Morecambe Missile? 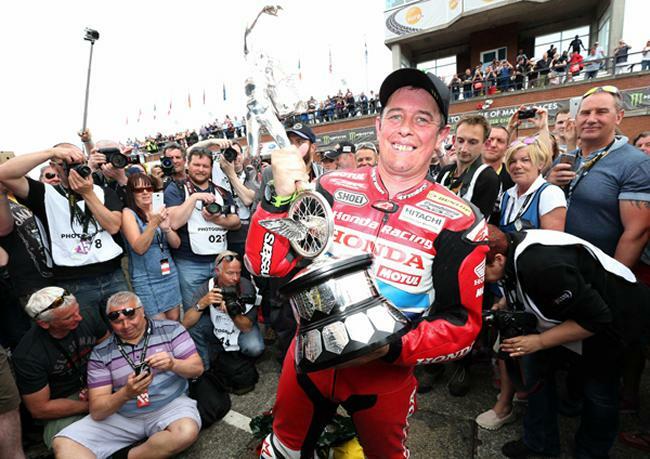 Is Peter Hickman ready to challenge for race wins in only his third year, or is Ian Hutchinson going to obliterate the field as he did in 2010. You can’t rule Bruce Anstey out of any race now that he’s broken his duck in the big bike class while James Hillier has served his apprenticeship and is ready to challenge for a Superbike win. And the emerging threat of the dynamic Lee Johnston, the revitalised Conor Cummins and the irrepressible Dean Harrison can be added to the mix making it the most anticipated TT meeting for many years. In the sidecar class, new outright lap record holder Dave Molyneux is teaming up with Dan Sayle, undoubtedly a winning partnership with the most successful driver and most successful passenger in history back in tandem but with no less than seven race winning drivers set to line up next year including world champions Tim Reeves and the Birchall brothers, not to mention John Holden back with the fit again Andy Winkle, no one starts the clear favourite. Tickets are also available for the 2016 Classic TT presented by Bennetts, now widely considered the world’s leading Classic Bike Races. Many of the leading TT riders now compete in the event on some of the greatest marques and machines in motorcycling history. This year’s event features a new four race schedule with race days on Saturday 27th and Monday 29th August as well as a series of special events including the traditional no holds barred Classic TT Party on Saturday 29th and the Classic TT dinner with some of the greatest names in motorcycling history on Sunday 30th.